Need to make sure your backflow certification is up to date and the device is working properly? Call Heidler, Inc. to work with your Annapolis backflow testing and certification experts. Contact us at (410) 268-7191 to set up an appointment. Click here to view our current specials and discounts. Annual backflow testing is imperative in homes with boiler, irrigation, or fire suppression systems. A properly working backflow device prevents contaminants from entering your potable water supply. If you have recently moved into a new home, make sure your property has a backflow device installed, and that it is up to date on all certification requirements. 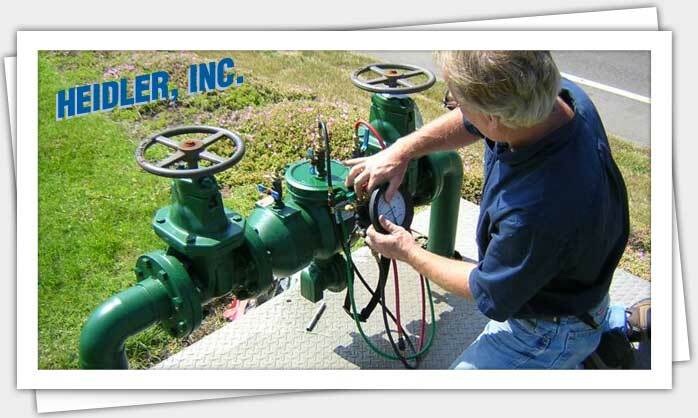 Look to your Annapolis backflow testing specialists at Heidler, Inc. for immediate service. We will help you file the necessary paperwork with the local municipality to ensure your device is compliant. Click here to read our latest customer reviews. What are the laws regarding backflow? If you live in Annapolis or surrounding areas, you likely have a backflow prevention device installed if you are connected to a municipal water supply. You are required by law to have this device tested regularly, so you are up to date on any problems that may be developing. If problems are detected, the device must be repaired or replaced immediately. We will help you through the process with no stress on your part. Backflow can make your drinking water unsafe. It involves contaminated water entering your drinking water supply. If you have an irrigation system and spray chemicals on your lawn, the backflow device prevents these chemicals from contaminating your water supply. Annual testing ensures that your prevention device is efficiently keeping your drinking water safe. Our licensed professionals will test the backflow device to ensure that it is not allowing any water or chemicals back through to your water supply. The testing process is quick and you will be able to have your backflow device certified once we determine that it is working properly. Is your home safe from backflow? Make sure your backflow device is compliant with local regulations. Call us at (410) 268-7191 to schedule an immediate test. Heidler, Inc. will help you file the paperwork you need to have your backflow device certified.